Back in college, my electric air popper was the highlight of my dorm floor, along with the beer die table residing at one end of the hall and the large screen TV at the other. I attracted my neighbors for study breaks (and post-beer die game drumunchies) with the aroma of freshly popping corn. I’ve graduated to not popping popcorn as a means of making new friends, and to using a regular old stove top and lidded pot to make the classic snack. 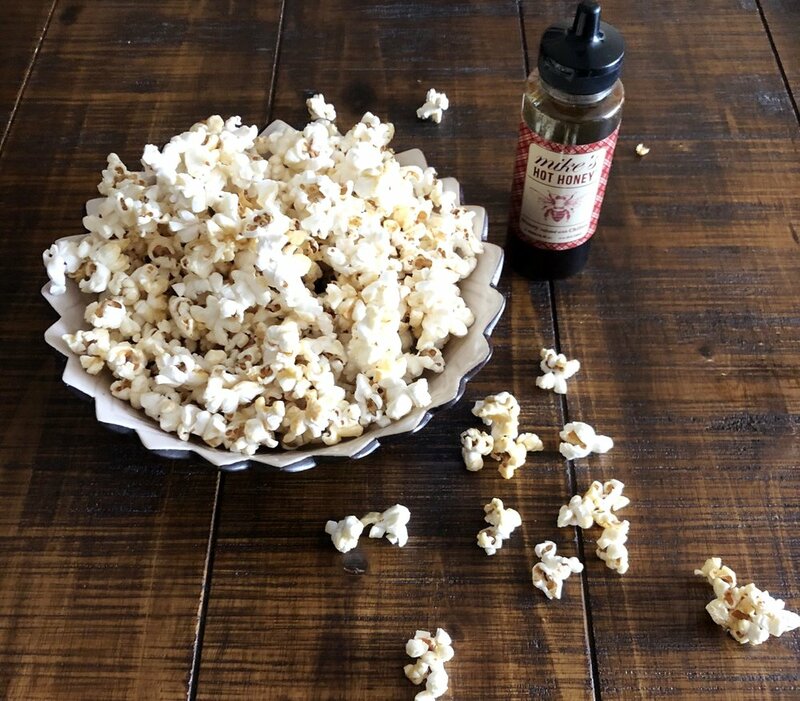 Since my Stove-top Popcorn has impressed and puzzled many guests for Saturday afternoon snacks or movie night at our place, I thought I’d share how you too can make some, followed by a few ideas for yummy toppings. Since I’ve been making popcorn this way, I have never had an un-popped kernel or burnt popcorn in a batch. I do, however, have occasional overflow of popped corn. But that is only a problem for…no one. 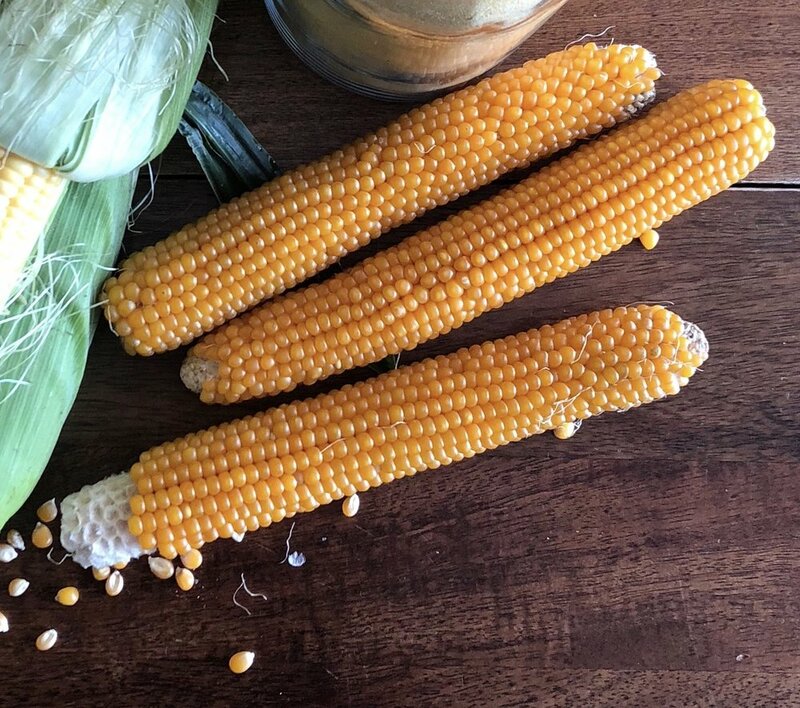 We get our popping corn dried on the cob from Farmer Ted at Windflower Farm, but any bagged popping corn will do. Add a thin layer of oil to an already heated pot over medium high heat. Test the oil for readiness by dropping in one kernel. If it sizzles immediately, add the remaining kernels. Fill the bottom of the pot with a single layer of popcorn kernels. Put the lid on the pot and LISTEN. As soon as you hear popping, shake the pan continuously and vigorously over the heat until the popping sound subsides. Transfer popped popcorn to a bowl and season however you like. Of course you can go with the classic butter and salt topping, but I encourage you to try these variations and use your own creativity. Herb Butter: melt butter and mince up any herbs you have on hand, such as thyme, rosemary and parsley. Better yet, if you have some of my herb garlic butter in your freezer, just melt that and toss with your popcorn. Sprinkle with salt and serve. Hot Honey Kettle Corn: Transfer the popped popcorn to a bowl and set aside. In the same pot, over low heat, melt a few tablespoons of butter. Add Mike’s hot honey (or any honey plus a couple teaspoons of dried chili flakes). Add the popcorn back to the pot and toss to coat. Transfer to a bowl. It will harden and get stickier as it cools. Truffle Parmesan: Use olive oil or a combination of olive oil and truffle oil to pop the popcorn. Toss the popped popcorn in melted butter, then sprinkle with truffle salt, grated Parmesan and freshly cracked black pepper. Salt and Pepper: ‘nuff said. Why does salt get all the attention when it comes to popcorn? Don’t leave out the black pepper. Coconut Curry: Use coconut oil to pop the popcorn. Toss popped corn with a curry powder, madras curry or garam masala spice blend you enjoy. Any spice mix plus salt and/or butter is a great addition to popped corn.